The Rangers, it seemed, were at it again. Trailing by two entering the third last night, they'd score two goals in the opening minutes of the period to tie the score and looked poised to add to their impressive seventeen points this season when losing after two periods. They'd allowed two goals in quick succession themselves in the second period to fall into that two-goal hole, but by now had been applying more pressure than Florida. (Perhaps they'd even win this one without relying on the shoot-out heroics of Mats Zuccarello.) Alas, all the hard work in the world couldn't make up for some bad luck. Mike Weaver registered Florida's only shot of the third period last night — one that would have gone wide had it not struck Artem Anisimov in the back as he skated near the net, causing the puck to pop up in the air and over Henrik Lundqvist for what would hold up as the game-winning goal. It was the second goal of the night, in fact, that had gone off of Anisimov. 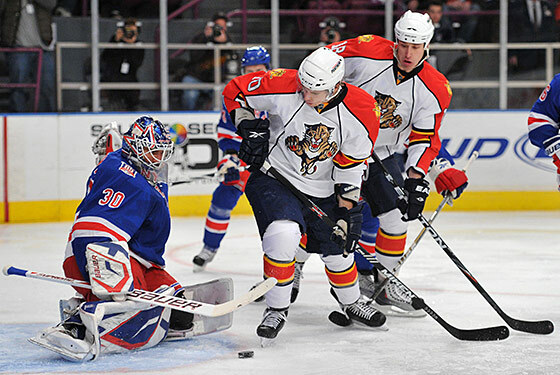 (The Panthers' first goal deflected in off his stick.) Thems, as they say, are the breaks. The Rangers don't play again until next Tuesday, and both Dan Girardi and Ryan Callahan are expected back for that game. In the meantime, it's a few days off for everyone not headed to either Raleigh or Hartford. For a group that's played five games in seven nights while many of their teammates nurse injuries, it's a break they badly need.